Since you’re visiting my dog blog, you probably want to know who I am, right? Here’s a little bit about me… The basics for those lazy readers who don’t wanna read my full bio. Living Arrangements: Living with my Human Mama. Gracie Lu Shih Tzu is a young shih tzu dog who enjoys Tweeting and Facebooking with her anipals, tormenting her cat brother (Mr. Pumpkin), running around in giant eights around her backyard and sometimes the living room, sleeping on Mama’s lap, licking everyone’s face, nibbling on fingers, and destroying stuffed toys. She was born on May 8, 2010. 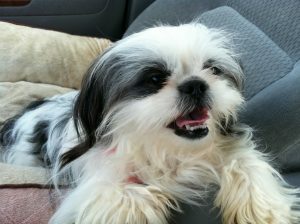 She was one of two girl shih tzus. 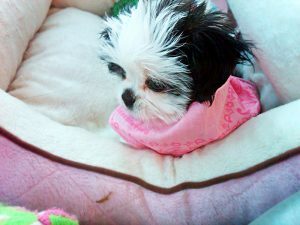 Her dog mom was an all-blonde shih tzu (named Xena), and her dog daddy was all black (named Zeus). Her real mom – her human mom – is a freelance writer and all around creative person, who has wanted a dog since she was little, but no one would ever give her one. Gracie Lu is her first dog ever, so she lives like a princess and is spoiled rotten. On a daily basis, Gracie Lu receives many tummy rubs, doggie massages, and plenty of playtime. She is also kissed multiple times during the day. 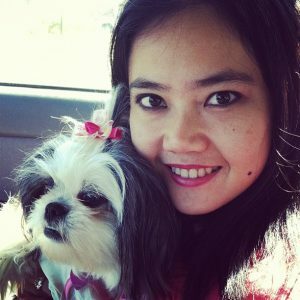 I am Shih Tzu a dog with a blog. I love dressing up for all the major holidays. I was a bumble bee for Halloween. I enjoy eating dirty underwear, leggings, and anything else that I can dig and drag around. I also enjoy chewing leaves from the yard – a habit I’ve had since I was a little puppy. Taking naps is one of my favorite hobbies. I also enjoy killing all my stuffed animals until their insides are all over the ground. Mama does a lot of sewing… And she also buys me plenty of toys when the old ones have to go into the trash can. Since I am super smart, I go by two names. Gracie Lu is my American name, but because my Mama is Vietnamese-born (though she grew up in the United States, since she was 7), her family couldn’t pronounce “Gracie” – they pronounced it like “Crazy,” so my Vietnamese name is “Chom-Chom” – which is an Asian fruit. I answer to both names, but Mama calls me “Chommie” a lot, so I think I like that best. I enjoy being carried around in a baby sling when I’m in public. I wear many, many dresses. My current favorite is my black and white polka dotted dress. I hate trying to do tricks. Sit and lay sound like the same command to me, so when Mama says “sit,” I sometimes lay down. The only trick I really know how to do is “Hi Five.” I stand up on my back paws and give her a high five. Everyone thinks it is so cute. I eat some organic dog food called Orijen from Canada. It’s made with fresh meat that is “fit for human consumption” Rich in meat and protein, low in carbs, free of grains and no plant oils. Before I started eating it, I was having bad eye stains, but now that I’m on this Orijen food, my eye stains have disappeared. Only when I happen to eat human food scraps, which is not too often, do I have eye stains. Mama says what you feed your dogs really is important. I would like to have homemade dog food, but we just don’t have the money for it. I’m very spoiled, as you can see. I have a boy friend named Chanh who lives with Mama’s parents. He likes to lick my face, and we have a lot of fun playing with each other. Any other questions, read my blog. You can also find about my every day goings-ons on my Twitter or Facebook page. Gracie Lu Shih Tzu’s mama is a twenty-something girl named DP. She is a writer, blogger, and lover of all things social media. In her spare time, she runs a pregnancy and baby boutique called Preggie Baby Boutique.